After getting several requests, we have decided to post the files for the crystals you can see here. The small crystals are what we used for that post. You can modify or take it as-is. The just bring it to a local 3D print shop, online service, or print it yourself if you own the right equipment. If you do, we would love to see pictures! 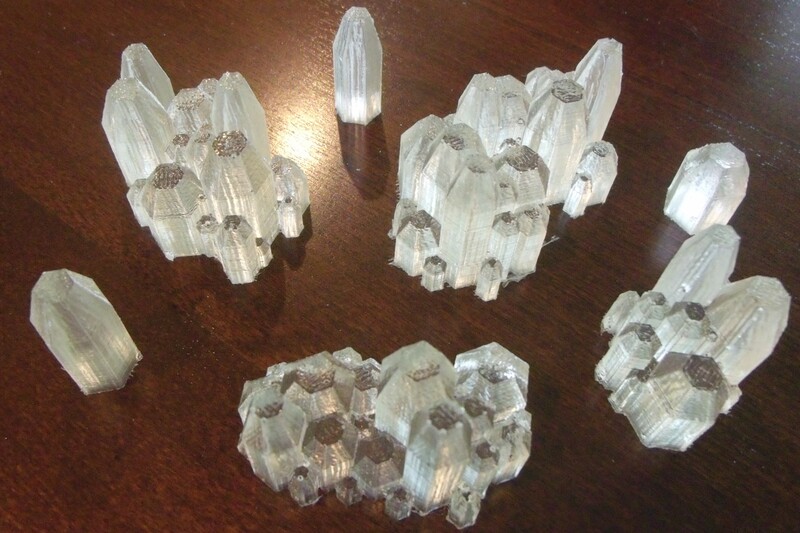 For reference, the large crystal file is ~5.63″ (143mm) tall. The small file is ~1.5″ (38mm) tall. These files will probably be expensive to print as-is if you go with a printing service. If you like the look of it, I would suggest scaling down first (especially for the Large file! ), but if you are feeling a bit crazy, go ahead! These are the files you want if you wish to go directly to printing. This file type is accepted by just about every business that does 3D printing. The models were originally made in Sketchup. Sketchup is a free, easy to learn 3D modelling program that was originally targeted at architects. This is your cleanest option if you want to edit the files. You are welcome! Let us know how they work for you or if you have any suggestions that you would like to see.